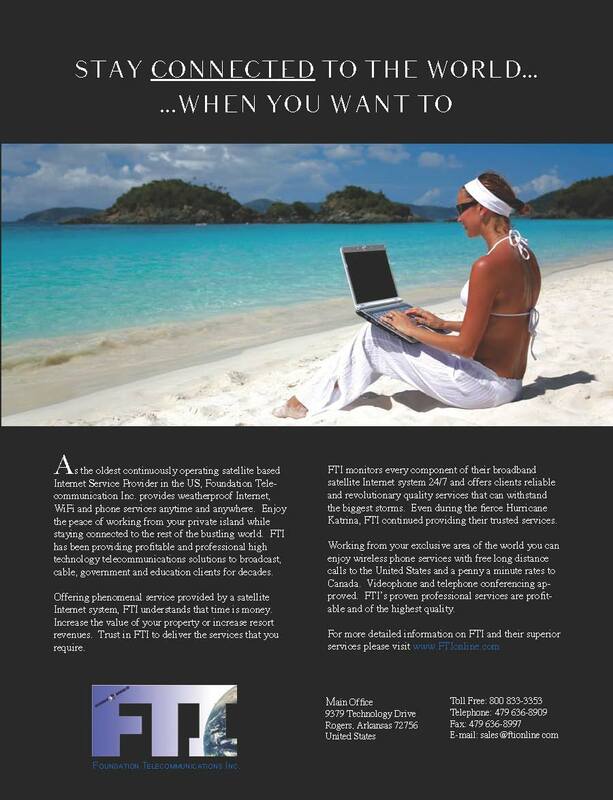 FTI provides High Speed Internet Services to Private Islands | Foundation Telecommunications Inc.
← FTI 2011 Product Spotlight: PRI in the SKY! Hurricane proof internet and phone anywhere!! Your own private internet/wifi and VoIP service. Systems already established in Samoa and Tonga. Now offering Voice Over IP Telephone services! Bring the internet home, no matter where home may be. As the oldest continuously operating satellite based Internet Service Provider in the US, Foundation Telecommunication Inc. provides weatherproof Internet, WiFi and phone services anytime and anywhere. Enjoy the peace of working from your private island while staying connected to the rest of the bustling world. FTI has been providing profitable and professional high technology telecommunications solutions to broadcast, cable, government and education clients for decades. Offering phenomenal service provided by a satellite Internet system, FTI understands that time is money. Increase the value of your property or increase resort revenues. Trust in FTI to deliver the services that you require. FTI monitors every component of their broadband satellite Internet system 24/7 and offers clients reliable and revolutionary quality services that can withstand the biggest storms. Even during the fierce Hurricane Katrina, FTI continued providing their trusted services. Working from your exclusive area of the world you can enjoy wireless phone services with free long distance calls to the United States and a penny a minute rates to Canada. Videophone and telephone conferencing approved. FTI’s proven professional services are profitable and of the highest quality. This entry was posted in Commercial Satellite Internet, New Products. Bookmark the permalink.